In this article I will explain the concept of Encapsulation and how to implement it with the help of properties. It also sheds light on Why, When and How to use a property. Further It provides detailed explanation for creating a property with accessor and mutator methods and making a property read-only or write-only or read write both. Definition: The wrapping up of data and functions into a single unit (called class) is known as Encapsulation. All the programmers familiar to the object oriented programming world knows the above mentioned definition of Encapsulation but very few are aware about it's use and how to implement it in a project. Those who implement most of the time does not know that what they are doing is a technique of encapsulation. Data Encapsulation is the most striking feature of a class. The data is not accessible to outside world and only those functions which are wrapped in the class can access it. The function provides the interface between objects data and the program. This insulation of data from direct access by the program is called Data hiding or Information Hiding. This is implemented using the mutator and accessor methods of a property. Till here we went through the theoretical explanation. But the question is How, When and Why to use it in our projects? To understand this consider a class A with a private string variable Author as follows. Consider Another class B where I want to access the value of this variable Author. I'll make object of class A and will access the value. But the variable Author is not available for access because it is private. Now the option available is to make the author variable public which will allow it to be accessed form class B but this is a wrong technique. * What if I don't want the value of Author to be changed through an object of class A ? * What if I don't want to show the current value of Author but want to allow it to be changed thorugh an object of class A ? * What if I want to allow the users to see the current value but not to change throug the object of class A? If I'll make the variable public then I will not be able to achieve this. 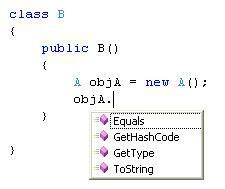 The value can be accessed and can also be changed through the class' object. The solution is in the formation of a property for Author variable. Hence the access to a variable's value should always be through a property. In C#, properties are natural extension of data fields. They are usually known as "smart fields". Why to use a property? Use of property for a variable of a class gives you control over the way the value of the variable to be accessed. A property encapsulates a variable of a class and defines the mode of access i.e. Read-Only, Write-Only or Both. To understand the above statement add the following code in class A which will create property for variable Author. Now if you want to access the value of variable Author from class B, you can access it through this property. We can access as well as modify or change the value of the Author variable through the property as follows. Using the property we can control what the user can do with the value of the variable. For example when someone creates the object of class A, then I want the value of the Author variable to be available for accession but it should not be changed or modified through the object of class A. In other words I want to make the author variable Read-Only. This can be achieved by tailoring the AuthorName property as follows. 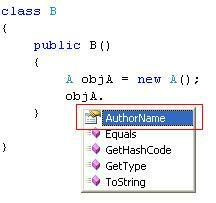 Now the user (object of class A created in class B) can get the value of Author but will not be able to set it. Next consider the requirement as vice versa. I want to allow any object of class A to change the value of author variable but no one should be able to see what it's current value. In other words I want to make the variable author Write-Only. For this tailor the AuthorName property as follows. We have learnt the very important concept of encapsulation with its practical implementation using properties. We have also seen how the mutator and accessor methods of the property give full control over the way the value of the variable of a class to be accessed. And finally we learned how to tailor the properties in order to make them read-only and write-only. I have a little doubt that if i m having two objects viz objA and objB of the class A and using objA i have changed value as "Tony", now if i try to access the value of objB.AuthorName, ll it return the default value 'Sibtain' or changed value 'Tony'?, (since both the object ll point to the same memory), Help me out to clear the doubt, thanks in advance. You made a statement "since both the object point to the same memory". Class Acts as a blue print for creating objects which means objA will have its own existence in memory and will not be linked at all to objB. As both have different memory space and no link in between, so the objB.AuthorName will not show the reflection of the changes made by using objA.AuthorName. Both are independent and different from each other. If you want to make that happen i.e. changes in one object to be reflected in the other then you have to make the variable static (shared in case of VB.Net). A static variable of a class has only one copy in the memory and all the objects of the class refer to the same copy. Hence if you change the AuthorName to "Tony" it will get reflected in all the objects of class A.
for clearing my doubt and for saying abt the use of shared / static variable. from the doubt of priya k encapsulation definition is clear that how both object data are separate and hide information each other . Understand the object-oriented principle of Encapsulation. Learn the available modifiers for type members. Protect object state through properties. What is Encapsulation and How Does It Benefit Me? In object-oriented programming, you create objects that have state and behavior. An object's state is the data or information it contains. For example, if you have a BankAccount object, its state could be Amount and CustomerName. Behavior in an object is often represented by methods. For example, the BankAccount object's behavior could be Credit, Debit, and GetAmount. This sounds like a nice definition of an object, and it is, but you must also consider how this object will be used. When designing an object, you must think about how others could use it. In a best-case scenario any program using the object would be well designed and the code would never change. However, the reality is that programs do change often and in a team environment many people touch the same code at one time or another. Therefore, it is beneficial to consider what could go wrong as well as the pristine image of how the object *should* be used. In the case of the BankAccount object, examine the situation where code outside of your object could access a decimal Amount field or a string CustomerName field. At the point of time that the code is written, everything would work well. However, later in the development cycle, you realize that the BankAccount object should keep track of an int CustomerID rather than string CustomerName because you don't want to duplicate relationships between information (or some other valid reason to alter the definition of internal state). Such changes cause a rippling effect in your code because it was built to use the BankAccount class, as originally designed (with CustomerName being a string), and you must now change code that accesses that state throughout your entire application. The object-oriented principle of Encapsulation helps avoid such problems, allowing you to hide internal state and abstract access to it though type members such as methods, properties, and indexers. Encapsulation helps you reduce coupling between objects and increases the maintainability of your code. Table 19-1. Type member access modifiers control what code has access to a specified type member. As you've learned from previous lessons of the C# Tutorial, types contain several types of members, including constructors, properties, indexers, methods, and others. Rather than show you an exhaustive list of all of the permutations of access modifiers you can use with these members, I'll take a more practical approach and describe a sub-set of access modifiers used on properties and methods. It's common to encapsulate the state of your type with properties. In fact, I always wrap my type state in a property. In Listing 19-2, you can see how the name of the customer is held in the m_name field, but it is wrapped (encapsulated) with the CustomerName property. Because m_name is declared as private, code outside the BankAccountPrivate class can't access it directly. They must use the public CustomerName property instead. Returning to the BankAccount example, what if you needed to call code to close an account? Furthermore, what if there were different types of accounts? Each of these different account types would have their own logic for closing, but the basic process would be the same for all account types. If this sounds to you like the description of Polymorphism, you would be on the right track. Back in Lesson 9, we discussed polymorphism and how it allows us to treat different classes the same way. You may want to refer to Lesson 9 for a refresher before looking at the next example. The most important parts of Listing 19-3 are that the CloseAccount method is public and the other methods are protected. Any calling code can instantiate BankAccountProtected, but it can only call the CloseAccount method. This gives you protection from someone invoking the behavior of your object in inappropriate ways. Your business logic is sound. At the end of this section, you'll see an example of how to call the code in Listing 19-3. For now, it is essential that you see how the other pieces fit together first. Notice how SavingsAccount derives from BankAccountProtected. SavingsAccount can access any of the protected members of the BankAccountProtected class which is its base class. It demonstrates this fact via the call to base.DeleteAccountFromDB in it's DeleteAccountFromDB method. If the inheritance part of Listing 19-4 is a little confusing, you can visit Lesson 8: Class Inheritance for a refresher and better understanding. Each method of SavingsAccount has the protected access modifier also, which simply means that classes derived from SavingsAccount can access those SavingsAccount members with the protected access modifier. The same situation exists with the CheckingAccount class, shown in Listing 19-5. The CheckingAccount class in Listing 19-5 is implemented similar to SavingsAccount from Listing 19-4. If you were writing this, the difference would be that the methods of each class would have unique implementations. For example, the business rules associated with the final interest calculation would differ, depending on whether the account type was checking or savings. Notice the call to the base class method in the DeleteAccountFromDB method in CheckingAccount. Just like SavingsAccount, CheckingAccount has access to BankAccountProtected's protected method because it is a derived class. This is a common pattern in polymorphism because derived classes often have a responsibility to call virtual base class methods to ensure critical functionality has the opportunity to execute. You would consult the method documentation to see if this was necessary. Without a protected access modifier, your only option would have been to make the base class method public; which, as explained earlier, is dangerous. Since both SavingsAccount and CheckingAccount derive from BankAccountProtected, you can assign them to the bankAccts array. They both override the protected virtual methods of BankAccountProtected, so it is the SavingsAccount and CheckingAccount methods that are called when CloseAccount in BankAccountProtected executes. Remember that the only reason the methods of SavingsAccount and CheckingAccount can call their virtual base class methods, as in the case of DeleteAccountFromDB, is because the virtual base class methods are marked with the protected access modifier. In practice, most of the code you write will involve the public, private, and protected access modifiers. However, there are two more access modifiers that you can use in more sophisticated scenarios: internal and protected internal. You would use internal whenever you created a separate class library and you don't want any code outside of the library to access the code with internal access. The protected internal is a combination of the two access modifiers it is named after, which means either protected or internal. Clearly, a bank account is something you would want to access from outside of a class library. Therefore, it only makes sense to give it a public access modifier as shown in the BankAccountExternal class above. Encapsulation is used to restrict access to the members of a class so as to prevent the user of a given class from manipulating objects in ways that are not intended by the designer. While encapsulation hides the internal implementation of the functionalists of class without affecting the overall functioning of the system, it allows the class to service a request for functionality and add or modify its internal structure (data or methods) to suit changing requirements. Encapsulation can be illustrated with an example of an Employee object that stores details of that object. By using encapsulation, the Employee object can expose the data (like Name, EmployeeID, etc.) and methods (like GetSalary) necessary for using the object, while hiding its irrelevant fields and methods from other objects. It's easy to see a situation in which all users could access basic information about an employee while restricting salary information.